Learn how to rock climb with my clinic which will introduce the sport and teach the proper techniques and use of equipment so that student will be able to participate in a top-rope climbing experience. I will travel to a local climbing site where we will first work on the skills needed to climb responsibly and efficiently and then enjoy a selection of appropriate climbs to work on moving on rock. 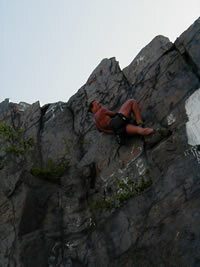 Belaying, bouldering, knot tying and efficient climbing techniques will be covered. All gear and round trip travel will be provided distance and rates of the trip vary upon the student’s preferences.